We all have those days when getting out from behind your desk isn’t really an option. While you’re warm and cozy in your cubicle, you might have noticed all that sitting takes a serious toll. And that’s why an easy post-work stretching routine—one that includes some of the best hip flexor stretches we could find—is just what you need after a long day. If you’re somewhat immobile for extended periods of time, your hip flexors—the muscles on the front of the hips—”shorten,” shifting your pelvis and creating that awful nagging pain in your lower back. Amanda Bisk, an Australian exercise physiologist and yoga instructor, explains that it doesn’t take much to regain lost flexibility in the hips. 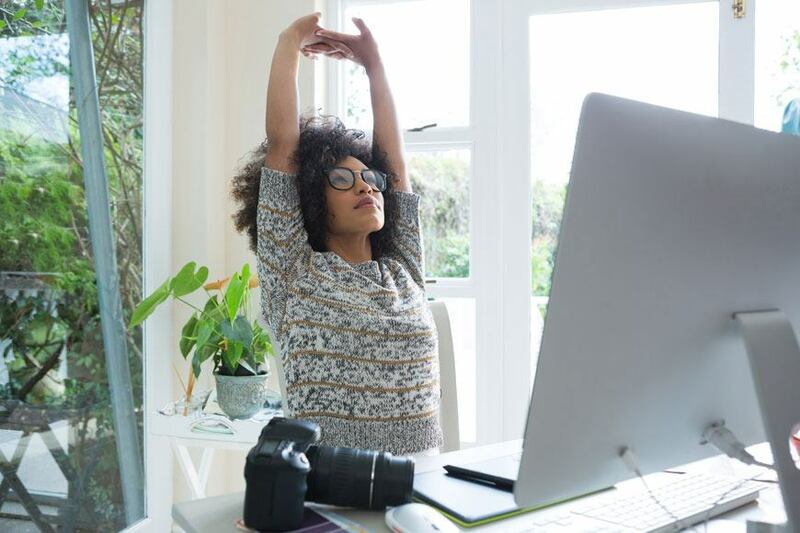 Each stretch requires only a few minutes and minimal movement, but her recommendations are just enough to really make a significant difference in the way your body feels. Hold these stretches—explained by Amanda Bisk—for 10 long, deep breaths each. This is great for directly targeting your hip flexors. Make sure your lunge is long with your legs split wide and your front toe in front of your knee. Inhale as you pull your belly button in and lengthen through your lower back, then exhale as you squeeze your bottom to push your hips forward. Tip: Keep your abs engaged for the entire stretch and push against your knee to keep your chest up. This stretch gets deeper into your hip flexors. Reach your opposite arm up and back while your other arm reaches for your hamstring. Your bottom knee and fingers on the same side should create a big arc. Tip: Keep your belly button pulled in and don’t collapse in your lower back. This is an awesome way to get even deeper into the hip flexors. By pushing against the box, you allow greater hip extension. Tip: As you relax into the stretch (after the first five breaths), shuffle your back knee further back to increase the stretch. I find this stretch difficult, but it’s the best release for the hips—especially the muscle on the outside of your hip, which connects to your IT band. Make sure you flex your feet (with your toes pointing to the front) and aim to stack your shins on top of each other. If you can’t do this, straighten your bottom leg in front of you. Tip: Sit up tall (think of pulling your belly button forward) and reach forward to go deeper.